Ozone - water, effects, environmental, pollutants, United States, EPA, chemicals, industrial, world, human, power, sources, use, life, health, What Is Ozone? Ozone is a gas found in the atmosphere in very trace amounts. Depending on where it is located, ozone can be beneficial ("good ozone") or detrimental ("bad ozone"). On average, every ten million air molecules contains only about three molecules of ozone. Indeed, if all the ozone in the atmosphere were collected in a layer at Earth's surface, that layer would only have the thickness of three dimes. But despite its scarcity, ozone plays very significant roles in the atmosphere. In fact, ozone frequently "makes headlines" in the newspapers because its roles are of importance to humans and other life on Earth. Chemically, the ozone molecule consists of three atoms of oxygen arranged in the shape of a wide V. Its formula is O 3 (the more familiar form of oxygen that one breathes has only two atoms of oxygen and a chemical formula of O 2 ). Gaseous ozone is bluish in color and has a pungent, distinctive smell. In fact, the name ozone is derived from the Greek word ozein, meaning "to smell or reek." The smell of ozone can often be noticed near electrical transformers or nearby lightning strikes. It is formed in these instances when an electrical discharge breaks an oxygen molecule (O 2 ) into free oxygen atoms (O), which then combine with O 2 in the air to make O 3 . In addition to its roles in the atmosphere, ozone is a chemically reactive oxidizing agent that is used as an air purifier, a water sterilizer, and a bleaching agent. Ozone is mainly found in the two regions of the atmosphere that are closest to the earth's surface. About 10 percent of the atmosphere's ozone is in the lowest-lying atmospheric region, the troposphere. This ozone is formed in a series of chemical reactions that involve the interaction of nitrogen oxides, volatile organic compounds, and sunlight. Most ozone (about 90%) resides in the next atmospheric layer, the stratosphere. The stratosphere begins between 8 and 18 kilometers (5 and 11 miles) above the earth's surface and extends up to about 50 kilometers (30 miles). The ozone in this region is commonly known as the ozone layer. Stratospheric ozone is formed when the sun's ultraviolet (UV) radiation breaks apart molecular oxygen (O 2 ) to form O atoms, which then combine with O 2 to make ozone. Note that this formation mechanism differs from the one mentioned above for ozone in the lower atmosphere. The ozone molecules in the stratosphere and the troposphere are chemically identical. However, they have very different roles in the atmosphere and very different effects on humans and other living beings, depending on their location. A useful statement summarizing ozone's different effects is that it is "good up high, bad nearby." In the upper atmosphere, stratospheric ozone plays a beneficial role by absorbing most of the sun's biologically damaging ultraviolet sunlight (called UV-B), allowing only a small amount to reach the earth's surface. The absorption of ultraviolet radiation by ozone creates a source of heat, which actually defines the stratosphere (a region in which the temperature rises as one goes to higher altitudes). Ozone thus plays a key role in the temperature structure of the earth's atmosphere. Without the filtering action of the ozone layer, more of the sun's UV-B radiation would penetrate the atmosphere and reach the earth's surface. Many experimental studies of plants and animals and clinical studies of humans have shown that excessive exposure to UV-B radiation has harmful effects. Serious long-term effects can include skin cancers and eye damage. The UV-absorbing role of stratospheric ozone is what lies behind the expression that ozone is "good up high." In the troposphere, ozone comes into direct contact with life-forms. Although some amount of ozone is naturally present in the lower atmosphere, excessive amounts of this lower-atmospheric ozone are undesirable (or bad ozone). This is because ozone reacts strongly with other molecules, including molecules that make up the tissues of plants and animals. Several studies have documented the harmful effects of excessive ozone on crop production, forest growth, and human health. For example, people with asthma are particularly vulnerable to the adverse effects of ozone. Thus, ozone is "bad nearby." Goddard Space Flight Center, National Aeronautics and Space Administration. 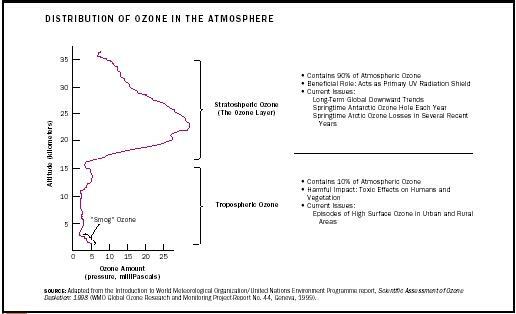 Adapted from the Introduction to World Meteorological Organization/United Nations Environment Programme report, Scientific Assessment of Ozone Depletion: 1998 (WMO Global Ozone Research and Monitoring Project-Report No. 44, Geneva, 1999). the troposphere (the bad ozone mentioned above). Human activities that add nitrogen oxides and volatile organic compounds to that atmosphere, such as the fossil fuel burning associated with power-generating plants and vehicular exhaust, are contributing to the formation of larger amounts of ozone near the earth's surface. This ozone is a key component of photochemical smog, a familiar problem in the atmosphere of many cities around the world. Higher amounts of surface-level ozone are increasingly being observed in rural areas as well. Thus, the environmental issue is that human activities can lead to more of the bad ozone. The second environmental issue relates to the loss of ozone in the stratosphere. Ground-based and satellite instruments have measured decreases in the amount of stratospheric ozone in our atmosphere, which is called ozone-layer depletion. The most extreme case occurs over some parts of Antarctica, where up to 60 percent of the total overhead amount of ozone (known as the column ozone) disappears during some periods of the Antarctic spring (September through November). This phenomenon, which has been occurring only since the early 1980s, is known as the Antarctic ozone hole. In the arctic polar regions, similar processes occur that have also led to significant chemical depletion of the column ozone during late winter and spring in many recent years. Arctic ozone loss from January through late March has been typically 20 to 25 percent, and shorter-period losses have been higher, depending on the meteorological conditions encountered in the Arctic stratosphere. Smaller, but nevertheless significant, stratospheric ozone decreases have been seen at other, more populated latitudes of the earth, away from the polar regions. Instruments on satellites and on the ground have detected higher amounts of UV-B radiation at the earth's surface below areas of depleted ozone. What Human Activities Affect the Stratospheric Ozone Layer? Initially, theories about the cause of ozone-layer depletion abounded. Many factors were suggested, from the sun to air motions to human activity. In the 1970s and 1980s, the scientific evidence showed conclusively that human-produced chemicals are responsible for the observed depletions of the ozone layer. The ozone-depleting compounds contain various combinations of carbon with the chemical elements chlorine, fluorine, bromine, and hydrogen (the halogen family in the periodic table of the elements). These are often described by the general term halocarbons. The compounds include chlorofluorocarbons (CFCs which are used as refrigerants, foam-blowing agents, electronics cleaners, and industrial solvents) as well as halons (which are used in fire extinguishers). The compounds are useful and benign in the troposphere, but when they eventually reach the stratosphere, they are broken apart by the sun's ultraviolet radiation. The chlorine and bromine atoms released from these compounds are responsible for the breakdown of stratospheric ozone. The ozone destruction cycles are catalytic, meaning that the chlorine or bromine atom enters the cycle, destroys ozone, and exits the cycle unscathed and therefore able to destroy another ozone molecule. In fact, an individual chlorine atom can destroy as many as 10,000 different ozone molecules before the chlorine atom is removed from the stratosphere by other reactions. Research on ozone depletion advanced very rapidly in the 1970s and 1980s, leading to the identification of CFCs and other halocarbons as the cause. Governments and industry acted quickly on the scientific information. Through a 1987 international agreement known as the Montréal Protocol on Substances That Deplete the Ozone Layer, governments decided to eventually discontinue production of CFCs (known in the United States by the industry trade name "Freons"), halons, and other halocarbons (except for a few special uses). Concurrently, industry developed more ozone-friendly substitutes for the CFCs and other ozone-depleting halocarbons. If nations adhere to international agreements, the ozone layer is expected to recover by the year 2050. The interaction of science in identifying the problem, technology in developing alternatives, and governments in devising new policies is thus an environmental "success story in the making." Indeed, the Montréal Protocol serves as a model for other environmental issues now facing the global community. What Actions Have Been Taken to Reduce the Amount of Ozone at Ground Level? Ozone pollution at the earth's surface is formed within the atmosphere by the interaction of sunlight with chemical precursor compounds (or starting ingredients): the nitrogen oxides (NO x ) and volatile organic compounds (VOCs). In the United States, the efforts of the Environmental Protection Agency (EPA) to reduce ozone pollution are therefore focused on reducing the emissions of the precursor compounds. VOCs, a primary focus of many regulations, arise from the combustion of fossil fuel and from natural sources (emissions from forests). Increasingly, attention is turning to reducing the emissions of NO x compounds, which also arise from the combustion of fossil fuels. The use of cleaner fuels and more efficient vehicles has caused a reduction in the emission of ozone precursors in urban areas. This has led to a steady decline in the number and severity of episodes and violations of the one-hour ozone standard established by the U.S. Environmental Protection Agency (EPA) (which is 120 parts per billion or ppb, meaning that out of a billion air molecules, 120 are ozone). In 1999 there were thirty-two areas of the country that were in violation of the ozone standard, down from 101 just nine years earlier. Despite these improvements, ground-level ozone continues to be one of the most difficult pollutants to manage. An additional, more stringent ozone standard proposed by the EPA to protect public health, eighty ppb averaged over eight hours, was cleared in early 2001 for implementation in the United States. For comparison, Canada's standard is sixty-five ppb averaged over eight hours. SEE ALSO A IR P OLLUTION ; A STHMA ; CFCs (C HLOROFLUOROCARBONS) ; E LECTRIC P OWER ; H ALON ; M ONTRÉAL P ROTOCOL ; NO x (N ITROGEN O XIDES) ; S MOG ; V EHICULAR P OLLUTION ; U LTRAVIOLET R ADIATION ; VOCs (V OLATILE O RGANIC C OMPOUNDS) . World Meteorological Organization. (2003). Scientific Assessment of Ozone Depletion: 2002. Global Ozone Research and Monitoring Project, Report No. 47. Geneva: World Meteorological Organization. University Corporation for Atmospheric Research. "Cycles of the Earth and Atmosphere—Module Review." Available from http://www.ucar.edu/learn/1.htm . U.S. Environmental Protection Agency. "Automobiles and Ozone." Available from http://www.epa.gov/otaq/04-ozone.htm . U.S. Environmental Protection Agency. "Ozone Depletion." Available from http://www.epa.gov/docs/ozone .